It's what you do with that capacity that matters. The cloud is certainly a way of rapidly scaling up an IT infrastructure without pouring money into new IT hardware to get a channel, or many channels, on air quickly and easily. Moving and managing media via a data centre environment has been our business for more than 15 years, which is long before it became trendy for television, but of course, we're rooted in an IT world, so we know how it works. Always have. Right now it's fashionable to say that broadcasters are under threat from OTT and VoD services, and there's truth in that. OTT streaming alone is the world's fastest growing form of video consumption. Is television therefore going away? Unlikely. There are still huge sums of money to be made from ad revenue. However, many broadcasters are now waking up, slowly but surely, to the realisation that a lot of that revenue is being absorbed by the cumbersome hardware they are using, which is not as agile as it should be to compete with the new services, or even add their own. This is because those hardware infrastructures still need to be amortised, maintained, or upgraded, all the while being seen by a younger generation as producing "grandad's TV". Such broadcasters are haemorrhaging money by clinging to outdated technologies, workflows, and, yes, suppliers. They don't have to. They can vastly reduce costs while simultaneously increasing revenue. Virtualisation, i.e., running playout, automation, routing - you name it in software from a virtual machine in an IP-based environment nestled in the cloud, achieves both. Deploying an IP-based infrastructure, as many are now moving to do, is a must for broadcasters who want to generate new revenue streams and adopt new formats such as 4K, 8K, or whatever our children come up with next. In short, while the cloud is the enabler, the key to sustainable growth is to use the cloud to virtualise processes and workflows. For example, if you want to launch a network of, say, 5000 hyper-localised TV stations today, that's technically possible, and you don't need 5000 playout servers to do it. Using the right software running on a web service you can spin those channels up whenever you want, and when you're done, you spin them right back down again. It's that simple. And, with virtualisation, the physical location from where those channels are spun up and maintained is irrelevant. You can do it from your living room if you want. Whether a playout service is running on a virtual server housed in Chicago, Dublin, or Sydney, it makes no difference over an IP network. With ping times typically under 2ms, which is less than a frame delay, it's invisible. 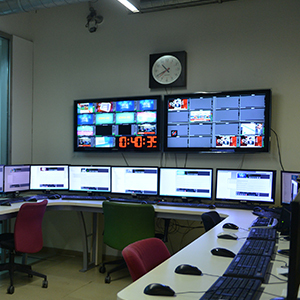 At the end of 2015, one of our long-term customers, Turkish broadcaster Dogan TV, the largest broadcasting group in the country, became the only national broadcaster in the world whose broadcasting and production workflows are now fully IP operated. They have no dependency on any proprietary hardware or format; the freedom to use any standard IT equipment they choose; and have a flexible and scalable system based on (ahem) our services running in virtual environments. Apart from a few legacy bits of technology, they are now tapeless. In January 2016, Belgian broadcaster VRT in conjunction with the European Broadcasting Union and a number of vendor partners completed what they say was the world's first full-IP remote live broadcast production, and by all accounts it was a great success. The BBC recently announced the start of its own initiative to move to an IP-based broadcast network that will deliver extra services and capacity more easily and at a far lower cost than its current system. So, no matter what your views on the cloud, and I have many, the evidence clearly points toward an IT- and IP-based virtual television world, folks. Get used to it. We're making plans of our own to port our software products and their capabilities into services such as Amazon Web Services (AWS). By making them available there, prospective users can test drive them in an HD or 4K cloud with no obligation. If they like it (and we believe they will) they can simply subscribe to the Cinegy services they require and, in effect, adopt software-defined television to move and monetise their content at a fraction of the outlay they would expect given more traditional methods. But in any case, to take advantage of IP and the cloud properly, the mind-set of traditional approaches to broadcasting has to change almost completely. Reinvention doesn't come from clinging to legacy hardware and workflows, it comes from embracing change. You can't be agile while clinging to black boxes. You can, however, be light as a feather in a data centre. And besides, "virtualization" is worth 26 points in Scrabble, if you use a "z".